NWU’s NorCal members will gather February 14-17 to staff an information table at the San Francisco Writer Conference (SFWC), a celebration of craft, commerce and community. More than 700 writers attending from around the country will have opportunities to meet publishers, editors, reviewers, and media experts in multiple genres. These include fiction, non-fiction and children’s books. NWU volunteers will hear keynote speeches, attend master classes, sign-up for pitch sessions, and join in dinners and parties geared to help writers. They’ll have an opportunity to hone their skills, and sell books through the local West Portal Bookshop. NWU member Brigid O’Farrell will participate in a writing history panel with our partners at the Mechanics Institute. Signing up new NWU members is also a goal of our participation. 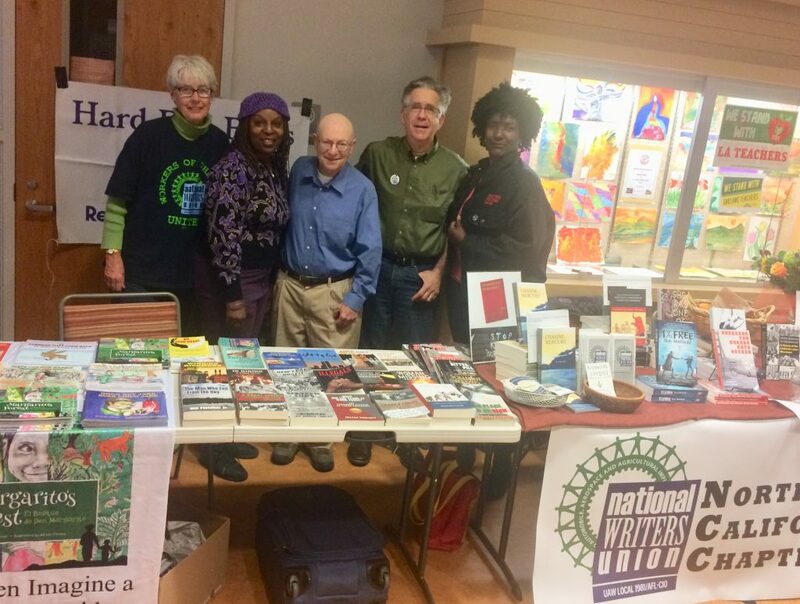 Nor Cal NWU also participated in the 5th annual Zinn Book Fair in San Francisco on December 2. “Fighting for the Air We Breathe” was the theme, and NWU had two tables at the gathering, which brings together several hundred authors, bloggers and publishers. There are readings, panel discussions, workshops and book for sale. We had several NWU authors present to talk to potential members. Nor Cal sold their works alongside NY NWU member Tim Sheard, who helped his Hardball Press table. At events such as this one, NWU members get great exposure to a large progressive community in the Bay Area and from people who come to town from around the country.